The PW5 was the winner of the mid eighties attempt to create a new catogry of low cost gliders, the "World Class". 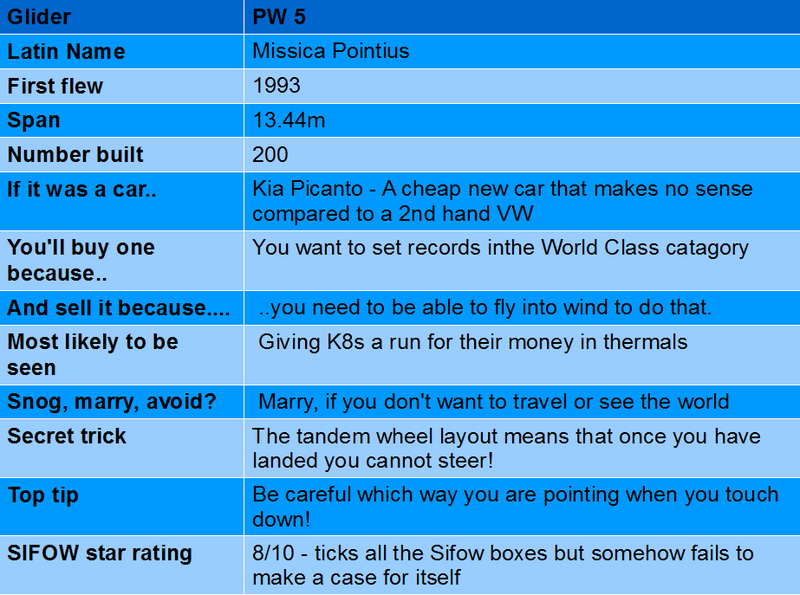 The PW5, whilst being cheaper than other new gliders, never hit the value button for many pilots, being more like a plastic K6 than a cheaper LS4 in terms of performance and with too many 'expensive' features such as the forward hinging canopy. In Europe, the success of the Club Class of gliders (a handicapped class for older gliders) was a further reason the World Class and so PW5 never really caught on. With a 13.4m wingspan and being fun to fly, it is certainly a Sifow glider and if you get a chance to fly one, I would recommend you give it a go.